NUFC talent wants out & could now join Arsenal – Everton & Celtic also keen – Report – NUFC blog – Newcastle United blog – NUFC Fixtures, News and Forum. 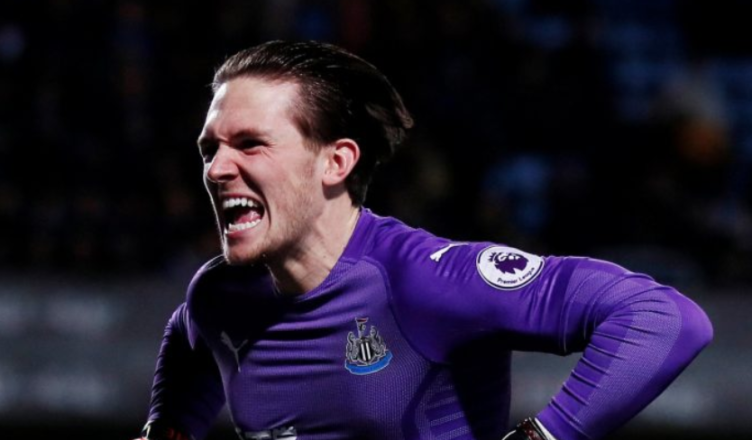 According to the Shields Gazette, Freddie Woodman has become ‘frustrated’ by his lack of opportunities at Newcastle and wants out this summer to ‘further his career’. Their story states that Arsenal are ‘leading the race’ for hi signature, but it’s also reported that the likes of Celtic, Everton and Fulham hold an interest in the England U-21 international. ‘Freddie Woodman could be set for a summer move to Arsenal after growing frustrated with his lack of opportunities at Newcastle United. ‘The young goalkeeper is understood to be on the radar of the North London giants as they look to bolster their ranks ahead of next season with Petr Cech retiring. ‘Woodman has made three first-team starts for Newcastle this season, all in the cups, and was on the bench for a number of Premier League games after injuries to Karl Darlow and Rob Elliot. ‘However, Darlow’s return to fitness has seen Woodman relegated from the matchday squad again, and he now finds himself in limbo and concerned about his career. ‘Woodman’s father, Andy, who was goalkeeper coach at Newcastle under Alan Pardew, is now head of Arsenal’s academy goalkeeping, while Chris Terpcou is also on the goalkeeping staff at Islington. Terpcou too worked alongside Woodman at Newcastle. ‘With Gunners No 1 Cech set to retire, Arsenal want someone to come in and challenge Bernd Leno, and have identified Woodman as one of the best young prospects. In all honesty, this wouldn’t surprise me in the slightest. He’s an England U-21 international yet he’s third choice at Newcastle now Darlow’s fit again, he only gets a chance in the cups and doesn’t seem likely to get in ahead of Martin Dubravka anytime soon – and rightly so. He must also be frustrated by the fact we refused to send him out on loan over the past few transfer windows. We’ve allowed his career to stagnate, so it may be best for all parties if we let him go – although it could be another moment we live to regret if he goes on to make it. We haven’t allowed his career to stagnate, that’s nonsense. He has been out on loan previously and has come back this season and been involved in the cups and tbh wasn’t overly impressive in those outings. He was given the opportunity to challenge Dubravka (clearly our best goalkeeper) and I guess the coaching staff who see him day in day out rate him behind Darlow. It’s easy to blame the club sometimes but he has had his chance and not yet taken it. You can’t give him the no2 slot purely because he is youngster he has to prove he is better than Darlow which it appears he hasn’t been able to convince the coaching staff he is. These articles are attention grabbing but that’s all without the facts. You think a few cup appearances is better than playing a full / half a season in the Championship? We blocked loan moves – that’s been made clear – and that doesn’t really add up for me. He goes from playing for England’s U-21’s (where SEVERAL of these players play week in week out at PL level) to coming back to sit on our bench (something he doesn’t do now Darlow’s back) or playing the odd cup game. Tough situation but not good enough from our perspective – even if he’s looked shaky the odd time we’ve seen him. I remember being pretty concerned when watching him against Blackburn. Looked very lightweight and unconvincing, but he’ll only get better with more games at senior level. That’s why I was baffled we blocked loan moves.